Debbie will air as a guest on the radio, this Sunday morning, November 25th from noon to 2:00 p.m. [MST] to chat with Kate Krueger. 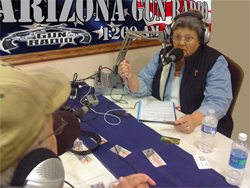 Kate’s Talking Guns program in on Independent Talk Radio KFNX 1100. The website http://1100kfnx.com also has a “Listen Live – Click Here” option in the top right corner*. Kate and Debbie met at the recent Babes With Bullets Class in Tucson. Maybe Deb will post a story on her experiences at the camp … hint, hint, nudge, nudge. “Kate has a strong firearms and martial arts background. Although she was not brought up around firearms her fighting spirit eventually brought her to that next logical step. She is an NRA Instructor and a certified Arizona Concealed Carry instructor as well. Her thirst for knowledge has led her to training facilities around the country, Smith & Wesson, Lethal Force Institute (now Massad Ayoob Group), Chapman Academy, Gunsite to name a few. Isshin Ryu was her style of choice in martial arts but she has continued to add to that background with ground fighting, hand to hand, weapon retention and other variants of weapon and empty hand techniques. Through martial arts and shooting competitions over the years she honed her skills. Kate is very passionate about the United States of America and all it stands for particularly the 2nd Amendment and our Constitution. So, if you’re not out Christmas shopping on Sunday morning, and home from church already, have a listen to Deb’s interview! * To listen to KNFX Live on their website, you must first install Microsoft Silverlight – the option is available on their site when you “click here”.